Well, since we're all a bit depressed over the basketball team, I'll be happy to relay the news that we've got new football uniforms coming for next season. 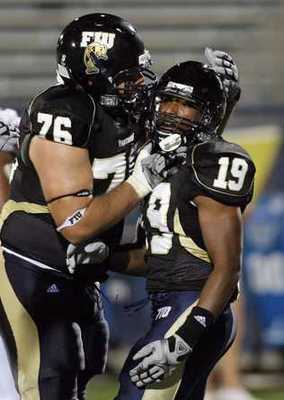 Keontae Hollis posted this status update on facebook: "OMG WAIT TILL YOU GUYS SEE THE NEW AKRON UNIS!!!!!" I asked when we'll get to see them. He replied, "First game of the season. They may leak out beforehand..."
Well this is long overdue. It may not seem like a big deal, but perception is everything. Everytime I see the current uniforms I can't help but think of the 1-11 seasons and the great Rob Ianello. The best way to predict what the new uniforms will look like is research current Adidas schools. Most teams have moved to techfit uniforms (Texas A&M, Notre Dame, Bowling Green, FIU, Louisville, Miss State, Cincy etc). They are extremely tight and usually pretty generic. Given that Akron is a smaller school I wouldn't expect an Oregon-type design. We just don't have the money for that. The Akron staff probably looked at an Adidas catalog, picked out a uniform template and told them what colors to make it. The helmet is the one exception, as I can see them doing a lot of cool stuff with it. Really though what is the point of keeping it a secret? The team has already seen them. Why not show the public and generate some buzz? That's also probably why the season ticket information said "back by popular demand...replica jerseys will be sold to the season ticket holders"? @AkZipper there is no doubt in my mind they will be releasing it to the public at some point before we see them. Because it is a great buzz creator. But I don't think Februrary is a good time for creating buzz. I agree with Balsy. They should take advantage of the mystique and slowly release portions to the public. I know many of us are divided on this, but I hope they build off of the Z-logo introduced at the Michigan game last year. I actually like the timing. It will help solidify the notion that this is a new era in Zip football. I'm glad they waited until things were turning the corner (we think, at least I do). I'd imagine they'd try to do something like what Miami did this year. Just a thought. I really, really hope they don't. We already got new helmet decals and gloves (the kind where you cross your palms to form an image) last season. New uniforms will likely continue the aesthetics established by that equipment. I just hope they use the actual school colors and don't throw in too much black or gray. I'm thinking mostly navy blue, with gold, white, and bright blue (like the zipper helmet stripe) accents. There are a lot of ways they can screw this up. If that's true, it would be kind of cool. I like the thought of tone on tone black (not matte), except for playing in the south in August and early September. The only thing better than new uniforms, is another thread about new uniforms. The only problem I have with that is that everyone has black unis now. It's a trend that's already on the way down as new looks begin to pop up. We need to use what's unique to us. I'd expect more gold, and more "Z"
+1. Even though I don't mind the A-Roo. The A-Roo is all over the sadium...and the field already...it is our emblem. I don't mind both however. Black is completely overused in sports and doesn't fit with blue/gold. The basketball team tried and it looks pretty bad. Last football team to try it was FIU. Black helmet, black jersey, blue pants. Looks terrible. Who cares what uniforms they wear, how about start winning more games. I don't care if they dress like the guards in The Longest Yard as long as they win. I don't care if they change our nickname to "Mean Machine" as long as they win. As part of our ongoing IMPACT 2020 Strategic Plan, we are seeking feedback from everyone associated with Zips Athletics regarding our brand identity. We have developed a survey to understand your thoughts on our brand – meaning logos, colors, merchandizing, etc. Click here to access the survey. We have some great prizes if you would like to provide your contact information as well. We look forward to hearing from you! Noticed in the first Spring Practice update that coach was wearing an Under Armour pull over. No Akron Logos, just wondering if there is anything in the old Adidas contract that would prevent that? Is it possible that Under Armour is the new uniform supplier for football? Good observation. I would LOVE being sponsored by Under Armour. Adidas just feels so second tier when you are talking about anything besides the other "football"
so does that mean the Jerseys that they're going to sell to us as Season ticket holders are also going to be Underarmour?